He warned Christians against placing themselves above others and called on the faithful to be in solidarity with the poor. I hope this proves an unexpected and welcome pleasure. And if you can, stay out of prison this holiday season! Several recording artists including most recently Martina McBride have been cancelling performances at parks like SeaWorld in San Diego after the revealing and troubling film BLACKFISH which reveals the conditions under which whales like the famous SHAMU are kept in captivity. I watched this film while thinking of all the times I attended “performances” at SeaWorld San Diego with my parents and grandparents who lived in nearby Escondido. How naive we all were to think that the whales were happy, healthy, and eager to please audience members like us. It’s never that simple. Take a moment to view the trailer and consider watching the film which is available now for immediate viewing on Netflix and other online sources. I have several candles of the type found in botanicas and at the grocery store, cylindrical clear class holders with paper images applied to the outside. To avoid overconsumption (many people burn these candles, toss them, then buy replacements), I have burned the original wax down inside each candle and then replaced it with a votive. That way I am only buying more wax and wick, which lowers my waste output and saves me money. I like these botanica candles because of their paper imagery pasted on them. They aid my focus and center my thought as I begin my day in prayer and contemplation. As I light each one, I reflect on its theme or message. There’s the “Holy Spirit,” and the “Guardian Angel.” This one is especially important for me because I believe my maternal grandmother, who passed in 2009, watches over me and protects me. I’ve felt her spirit particularly close to me through the struggles of this past year. Another candle, the “Sacred Heart of Jesus,” keeps me in touch with the central figure in my faith tradition, and the values that he embodies. 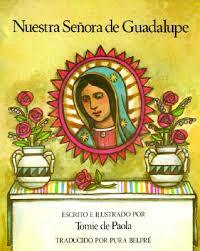 There is the “Virgin of Guadalupe” to remind me of the feminine in God, of the “mothering” as well as “fathering” aspects of the God of my own understanding. I also use the “Virgin” candle to remind me that we each have a part to play (Mary was a human being who played her part in bringing God into the world in the person of Jesus Christ – and when I live according to the values of my faith tradition I can also bring God into the world each day in a similar kind of way). The Virgin reminds me of the great country and people to the south, and of the ways in which growing up and living in Southern California is an experience as rich with Mexican traditions as the prevailing American ones. She reminds me of the possibility of miracles, and of the ways in which the Divine reveals itself to the common man as Mary revealed herself to Juan Diego in 1531 (my favorite telling of the story is found in the children’s book THE LADY OF GUADALUPE by Tomie de Paola ). I keep one botanica candle which is clear, without any image affixed to it, and I light this one each day for a different person or persons. I might light it as I pray for my mother, or a friend, or the memory of Nelson Mandela, or the people of the Phillipines after the terrible storm last month. I keep a second candle on my altar which rises on a stem and is encased in a hurricane of green glass. This candle I light for peace and justice in the world, and to remind me that I have a part to play in the advancement of each. I have two vases – one a bud vase for a single flower, and a larger vase for a small bouquet. These provide fragrance and beauty and remind me of life and its passing. 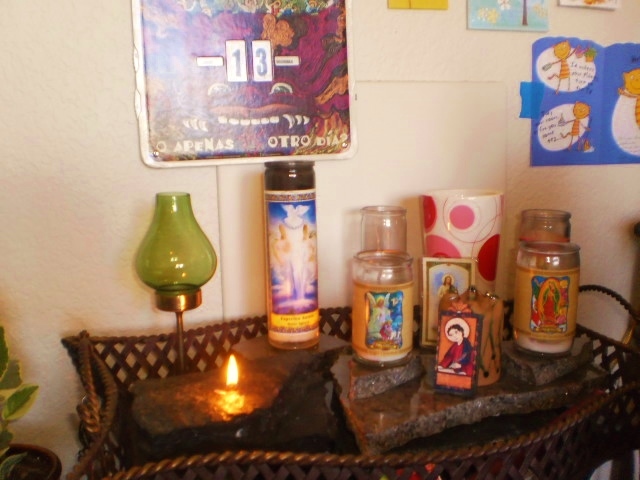 I have two items on my altar that were gifts – a small hand-painted image on wood of Saint John, the patron saint of writers and a small laminated card with the image of Jesus on it which was a gift from my Cuban friend Agustin. Finally, I have a special oil candle made of stone which has a “step” in it. This was given to me by my friend Rafael as a reminder of the importance of my sobriety and the power of the 12 steps in my life. 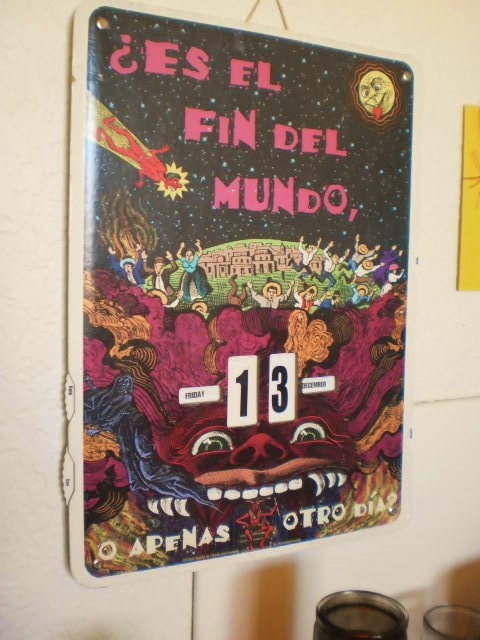 Behind my altar hangs a calendar, which reads in Spanish, “?ES EL FIN DEL MUNDO, O APENAS OTRO DIA?” (Is it the end of the world, or just another day?”). This great find came to me at a garage sale in Silver Lake years ago for just one dollar. It has dials on either side that allow me to change the day of the week, date, and month. Making the change each morning centers me in the here and now, and reminds me that yesterday has passed, and tomorrow will be “dialed up” another day so what about THIS day here and now? The calendar helps me keep things in perspective, and with it’s humorous text and illustrations it really amuses me. I don’t have to take myself or life too seriously. And it’s never the end of the world. 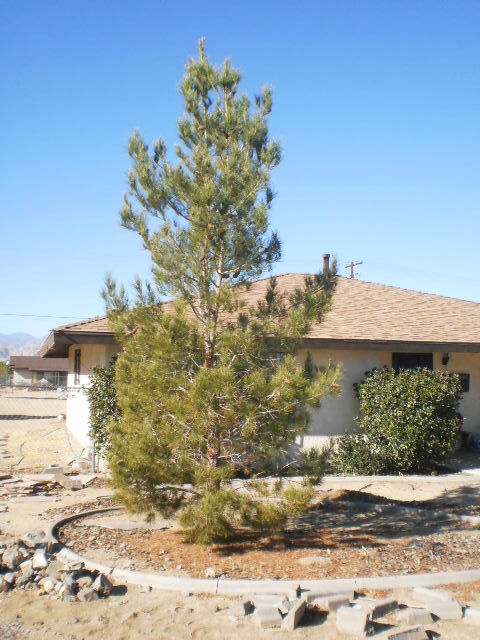 FOUR CHRISTMAS TREES at $28 EACH and FREE LANDSCAPING! That’s right. 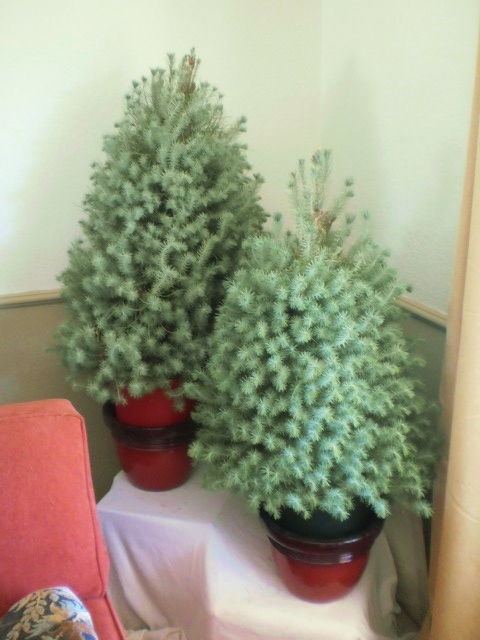 Four Christmas trees…three for my living room, and one for my bedroom. And they are all alive. That’s where the free landscaping comes in. After Christmas, they get to live in my yard! Pine trees do very well in the hi-desert. Check out the one I’ve got gracing my front yard. It’s tall and stately and healthy and strong, and I love looking out my window at it every morning. Years past I’ve always relied on a cut live tree. I’ve enjoyed every aspect of it – the texture, the fragrance, the interaction involved between me and the tree when I get on my knees every couple of days to replenish it with water. I even like the way it gets dry over time and then sheds needles all over the floor. Yes, it’s tough to clean up, but it’s a reminder of the passing of time. Jesus spent his first night in a room with a floor covered in hay. Why complain about a little blanket of pine needles? 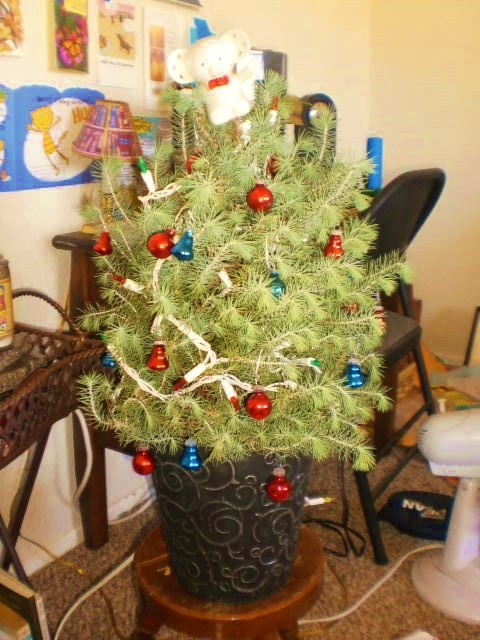 The living Christmas tree that brings holiday cheer to my bedroom. Sure it’s a little bit like that Charlie Brown tree, but give it time. This time next year it’ll be looking great! And so I went to my local Home Depot and bought four live trees. They are SOUTHERN CALIFORNIA RAISED (from Escondido, less than 200 miles from my home and an example of buying local and supporting regional business). They tolerate heat, drough and cold to –10 degrees Fahrenheit. And with care they will be around next year, and for many years after that. These four aren’t as large as the trees I’ve had in years past, but I just have to be patient. It’s okay to start small. This year I can go with MORE trees instead of one bigger tree slowly dying in the living room. I’ve placed two of the larger ones on platforms in the living room to give the illusion of height and being in a forest. I get to interact with them (they need water and sunlight). I’ve got the feel and fragrance that comes with a living, breathing, thriving pine. And with each year my trees will get taller and fuller, until they finally reach to the ceiling. The beginnings of my living room Christmas tree forest. Soon to be decorated with lights and ornaments. Glad to be alive and able to thrive! When the holidays are over its time to talk landscaping. 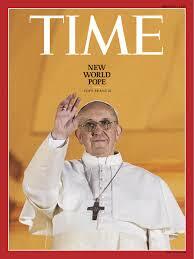 Two pines will go straight into the ground and be given liberty to grow and thrive in all directions. The remaining two, however, are getting placed in special pots. The two potted trees are going to be watched over carefully this coming year. They will be pruned to keep the shape of a Christmas tree, and fed and watered and nurtured for the next eleven months. And then they will be asked to do their duty as Christmas trees inside the house next December. And for many Decembers after. That’s why I got trees of different sizes. I’m thinking many Christmas holidays ahead. These trees are part of my family now. 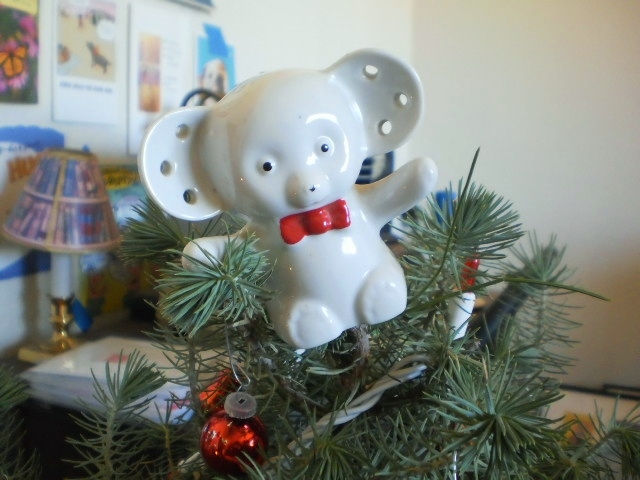 My bedroom Christmas tree topper, a ceramic bear bought at Angel View Thrift Mart for under a buck. There is something beautiful in knowing that these trees will be nurtured and loved and cared for all year long. It will be like having a bit of Christmas every single day. And bringing the tree into my house next December with it’s embedded memories of Christmases past provides a sense of continuity that you just can’t get from a plastic tree, or a dead one. My Christmas trees will experience growth and change, just as I will. We’re in this together. We’re survivors, getting fuller, taller, stronger day by day. MONEY BACK GUARANTEE: The trees from Home Depot came with a money-back guarantee. If any of them die in the year after being purchased, I can have my money back. Where else can you get that kind of assurance on a Christmas tree? 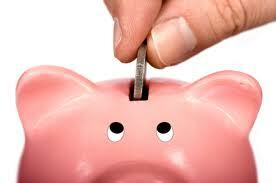 EXTRA SAVINGS: Did I tell you that I won’t have to buy any trees next year or the years after that? That’s some big time savings over time. MUSIC: IT’S LIKE A DREAM COME TRUE: Sonny & Cher & Bernadette Peters & Captain Kangaroo and Chastity (before she became Chaz) all singing a Christmas Medley! You just can’t go wrong with this one! It’s got something for EVERYONE! There’s a new four-footed resident at SCH. Mason was a lovely young dog who found himself living with someone who had amassed way too many dogs (probably an animal hoarder). When Animal Control officers stepped in, Mason was placed in the Yucca Valley Animal Shelter. But now he lives at our place. Take 2 minutes to view this short film and join with us in welcoming Mason to his new “forever” family. Oh for the days of Donny and Marie…a simpler time when life wasn’t burdened with cell phones or cable T.V. or cars that took unleaded gasoline. The Climate wasn’t changing, the fashions were fierce, the microwave and VCR hadn’t even been invented. And music came on vinyl and was played on a turntable unless of course you were lucky enough to have an 8-track. It was an innocent time. A simpler time, beautiful and serene. What happened? MUSIC: LITTLE RED LIZA and the BIG BAD WOLF are feeling CHRISTMASEY ALL OVER! This amazing minute and a half of a very young Liza Minelli appearing as Little Red Riding Hood alongside the Big Bad Wolf (actor Cyril Ritchard) is over the top camp! 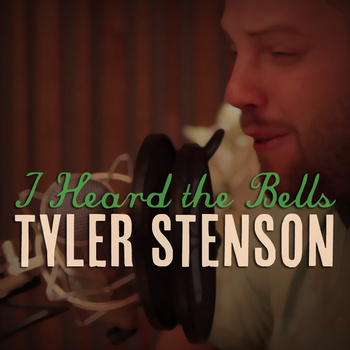 Tyler Stenson, the talented singer/songwriter out of Portland, Oregon always moves me with his expressive voice and deeply moving lyrical and melodic constructions. Here he deftly tries his hand at “I Heard the Bells”, breathing new and intriguing life into an old holiday standard. What a perfect choice, with lyrics that articulate the zeitgeist of our time. For years, whenever I would think of this song, I would hear in my head the voice of Johnny Cash peforming his 1960’s version for Capitol Records. I think now I’ll be hearing Tyler’s voice. Thanks Tyler. You’ve done it again. And before we forget, a shout out to the great American Poet who penned these lyrics in 1863: Henry Wadsworth Longfellow.